In a move starkly pointing to the risk of all-out war between the major powers in the Middle East, the US military said yesterday that it had scrambled fighter jets Thursday against government bombers inside Syria to protect US Special Forces operating with Kurdish « rebel » militias. Syrian President Bashar al-Assad’s regime sent two Su-24 bombers to bomb Kurdish People’s Protection Units (YPG) forces advancing on government-held positions in the city of Hasakah. The bombers nearly hit US Special Forces troops that are deployed illegally in Syria, embedded in the YPG. US officials tried to contact Syrian government and Russian forces operating in the region, and Russian officials replied that their bombers were not involved. 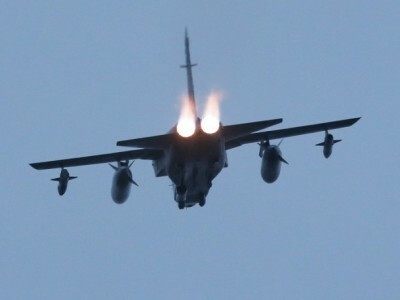 The US fighter planes arrived after the Syrian bombers had left the area, and no US soldiers were injured. Washington then stepped up its air patrols in the region. Yesterday, Pentagon spokesman Captain Jeff Davis warned of military action against any threat to US forces. Davis also criticized the Assad government for suddenly attacking the YPG, which until recently served as its de facto ally against CIA-backed Islamist militias. “This is very unusual, we have not seen the regime take this type of action against YPG before,” he said. Davis’ barely veiled threat that the Pentagon could attack Syrian government forces to protect its troops, which are operating in Syria in violation of the country’s sovereignty and without even the fig leaf of a UN mandate, points to the basic war aims of Washington and its European allies. Claims that their intervention is aimed at fighting Islamist terror groups, which evolved out of militias they supported against the Assad regime, are a political fraud. The imperialist powers’ goal was and remains regime-change. As the CIA arms the Al Qaeda-linked al-Nusra Front in Aleppo against Assad’s forces, the Pentagon is supporting the offensive of the YPG, which recently renamed itself the Syrian Democratic Forces (SDF) after absorbing a few smaller, ethnic-Arab militias. Washington’s reckless threats to use force against Syrian government forces risk escalating the conflict into a catastrophic global war of the United States and its European allies against the major powers intervening in Syria to defend the regime: Iran, Russia and now China. Tehran, Moscow and Beijing have all presented their operations in Syria as missions to fight Islamist terror groups alongside Washington. After Russia intervened in Syria militarily last year, Moscow and Washington developed channels of communications to prevent simultaneous US and Russian air strikes in Syria from accidentally leading to a military clash between the world’s two leading nuclear powers. The façade of international unity built around agreements to bomb the Islamic State in Iraq and Syria (ISIS) militia was, however, superficial and false. Washington and powerful forces in the European Union still aimed for regime-change, and deeply rooted conflicts persisted between the major powers. Moscow and Beijing fear the drive for hegemony in the Middle East mounted by Washington after the dissolution of the USSR in 1991—especially the regime-change policy applied in the illegal 2003 US invasion of Iraq, the 2011 NATO war in Libya, and then the Western-sponsored civil war in Syria. As Washington stoked conflict with Russia after toppling a pro-Russian regime in Ukraine in 2014, and with China over the South China Sea and North Korea, Moscow and Beijing concluded that they could not allow yet another violent, US-led regime-change, this time in Syria. US threats have not succeeded in whipping Russia and China into line. Instead, Russia and China are escalating their involvement in Syria. The near-confrontation between US and Syrian jets points to the danger that this situation will trigger a military clash—either with an accidental collision between US, Russian or allied forces in Syria or a deliberate attack intended as a signal to the opposing side—which could escalate into all-out war. The Syrian government launched more air strikes against YPG forces near Hasakah yesterday. Fighting had broken out earlier this week between Kurdish forces and the pro-regime National Defense Forces (NDF) militia in Hasakah, and the Syrian army issued a statement declaring it had “responded appropriately” to Kurdish attempts to conquer the city. Hasakah residents are reporting that both the US-backed YPG and pro-government forces are using heavy weaponry in the city. The Kremlin also launched large-scale air strikes on Islamist targets across Syria, in the north near Aleppo and in the northeast around Deir-ez-Zor. The strikes were mounted from warships in the Black Sea and by strategic bombers flying out of bases in Iran and Syria. Meanwhile, Chinese officials continued to voice support for the Assad regime after Beijing took the unprecedented step earlier this week of sending a high-level military delegation to Damascus. Admiral Guan Youfei, the director of the Chinese military’s Office for International Military Cooperation, agreed with Syrian Defense Minister Fahad Jassim al-Freij to step up Chinese personnel training and aid for the Syrian army. Citing Middle East Studies Professor Zhao Weiming of Shanghai International Studies University, the site also suggested that Beijing’s new Syria policy was retaliation for the US “pivot to Asia,” which seeks to isolate China. “Since the US has been interfering militarily in China’s backyard in the South China Sea, this could be push-back from the Chinese military into an area, the Middle East, that is usually considered a US sphere of military influence,” it reported. A major factor in the sudden public intervention of China into the Syrian conflict, Chinese analysts explained, is last month’s failed US-backed coup in Turkey. “In developing a closer relationship with Syria, one has to take into account the changes at hand in Syria and the region, including the fast recovering relations between Turkey and Russia,” said Wang Lian of the School of International Studies at Peking University. The Assad regime’s bombing of the YPG points to some of the geo-strategic concerns that underlay Washington’s decision to give at least tacit backing to the coup attempt. Washington’s search for reliable proxies in Syria, and, in particular, the Pentagon’s choice of the Kurdish YPG as a suitable candidate, ultimately united a wide coalition of countries against it. Turkish officials were deeply concerned that YPG victories in Syria would stoke Kurdish separatist sentiment within Turkey itself. The Syrian regime, backed by Russia and China, was preparing an attack on the YPG to keep it from gaining too much influence and setting up a US-backed regime in northern Syria. The failure of the coup in Turkey and the subsequent purge of pro-US Turkish officers suspected of sympathy for the coup only shifted Ankara closer to the Russian and Syrian regimes. The main danger that arises is that, in order to salvage its intervention in Syria, the US government and its allies will mount an even more reckless military escalation.